Create a new invoice as usual. Click on Rewards... to enter the amount of points being redeemed. Click OK to save and close the form. The reward redemption amount will be listed under a separate Reward Discount field under the Details tab of the invoice. Finish the invoice, adding any other information (Memo, Notes, or additional payment information). Click on the Rewards & Wish List tab. 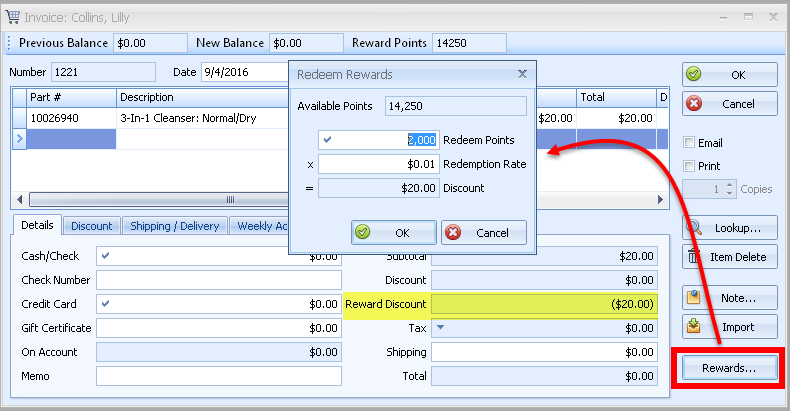 From the Rewards section, click to add a negative entry, or select a desired row then click to remove an entry. From the Edit menu, select Settings, then Reward. 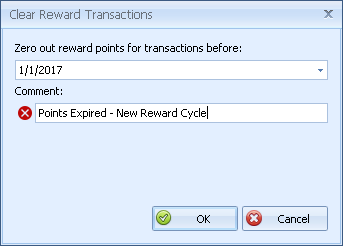 Enter the date to clear all previously earned rewards point transactions. Click OK , then Yes to confirm. Click OK to save and close the Reward Preferences form.